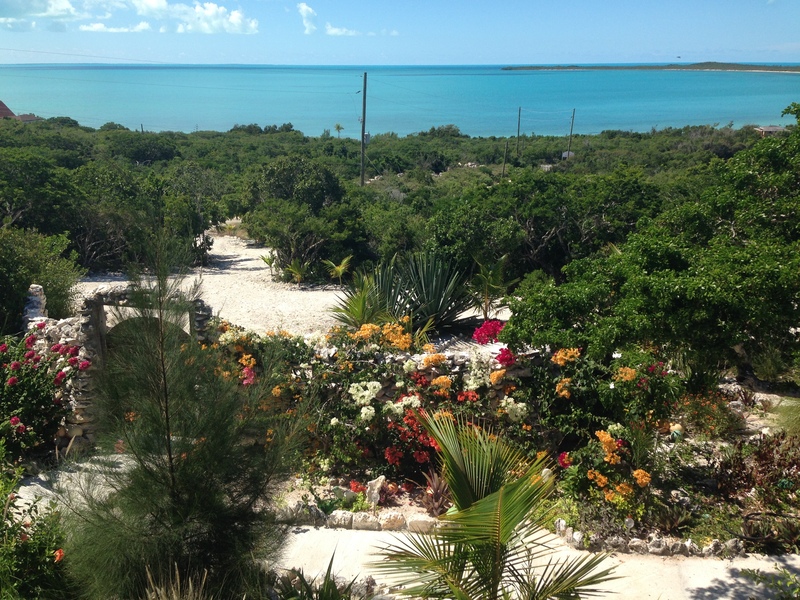 We arrived safe and on time -which as many may know is quite a miracle here in the Bahamas. It is said “If you have time to spare take Bahamas Air, or Bahamas Air is a Christian airlines, only God knows when it is coming and God knows when it is leaving”!!! 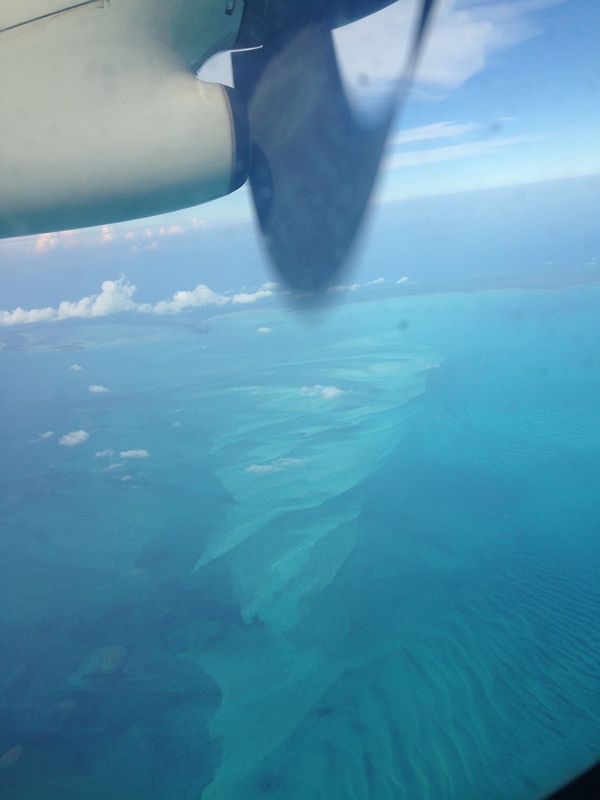 We were on Bahamas air and I am so thankful. The only other airline that flies into the island- Southern Air- has smaller planes and in all the wind and rain they cancelled flights for 2 days!!!!!! 2 days??!! Oh that would be so crazy/expensive to be stuck in Nassau for 2 days. Anyway I digress……home once again. It seems like we never left, that we just a few days ago putting things away to close up our home here and now we are busy as beavers opening it once again! But no it wasn’t a few days ago, it was 5 months ago and what a wonderful 5 months it was with traveling, spending time with family and friends and living in our camper in northern Ohio. Oh I digress yet again! More on that another time. September was a wild and stressful month with 2 hurricanes-Irma and Maria- to worry about and then a 3rd- Jose almost caught us out on the Otter Banks in North Carolina but we got off just a few hours ahead of the high tides crashing waves over the 1 road in/out blocking it with sand like snow in the north! So when I say we finally made it home…..it feels like a dream to be here. But then I wake up and see all the work to be done I know it is real. Living on an island to many is a picture of swinging lazily in a hammock on a beach with a frothy drink in hand. That can and does happen on occasion but not these first few weeks. 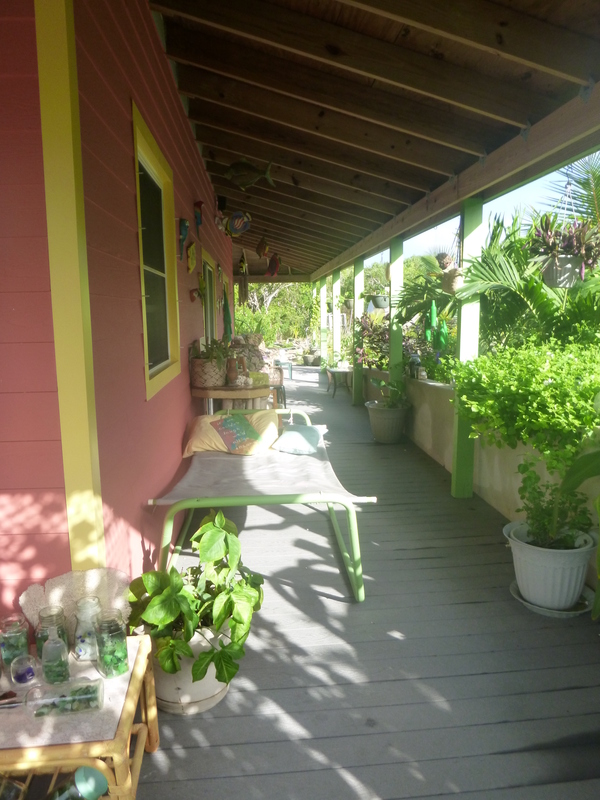 May I share the reality of having a home on an outer island in the Bahamas? I don’t write this lightly and definitely not complaining about all the work. Many lost all they had living on islands south of us and here also just 2 short years ago when Hurricane Joaquin devastated our precious island. We started building our first house here in 2000. It took a total of 7 months over 4 years, 30 days at a time as money would allow. It was 3200 sq. ft with 1000 sq ft of decks. It slept 10 and we ran it as a guest house for 4 years. 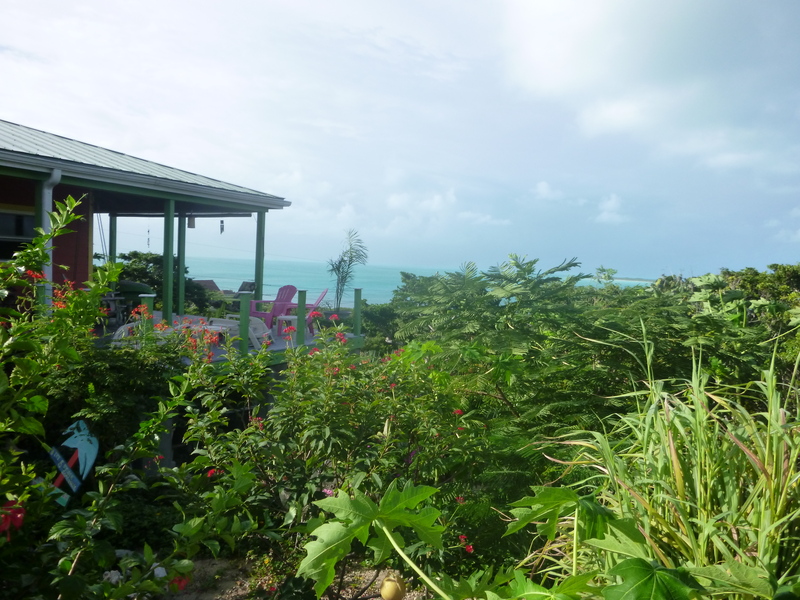 We picked guests up from the airport- which could be a $100 one way taxi ride, cooked breakfast, lunch and dinner and took them to any beach up and down the island. After 4 years of wonderful times with many friends and family we sold, built smaller- only 800 sq ft with 1400 sq ft of deck and only 2 small bedrooms. 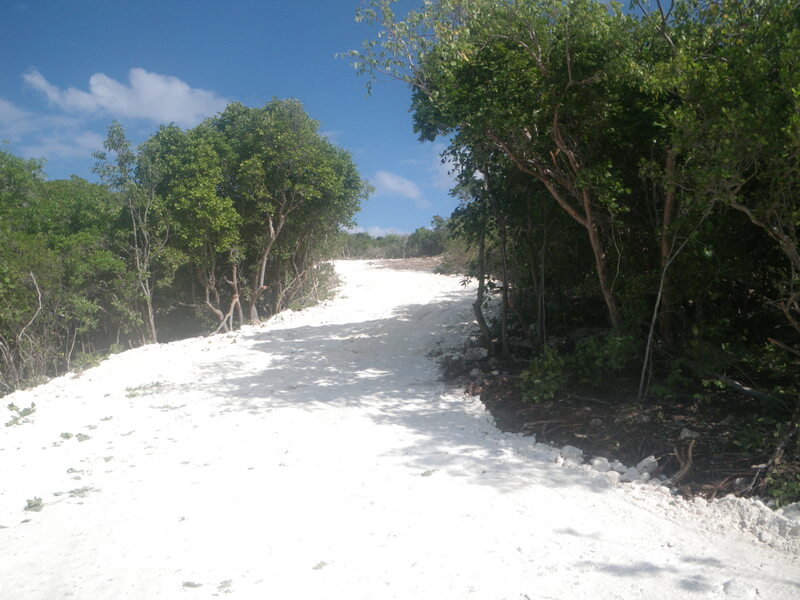 We had to put in solar- our wonderful Bahamas government was disputing with the electric company that we lived in a subdivision and it had to have electric, water and paved road in order to be called a subdivision. The electric company said we had to be called a subdivision first in order to get electric….and round and round we went so we got solar. It was a learning curve for sure. This is how I make coffee in the mornings. Boil water and pour into thermos to keep hot using only propane on the stove. WORKS! We put in all LED lighting, merely use big items like washer on full sun days and don’t own a dryer- have Gods dryer- clothes line. 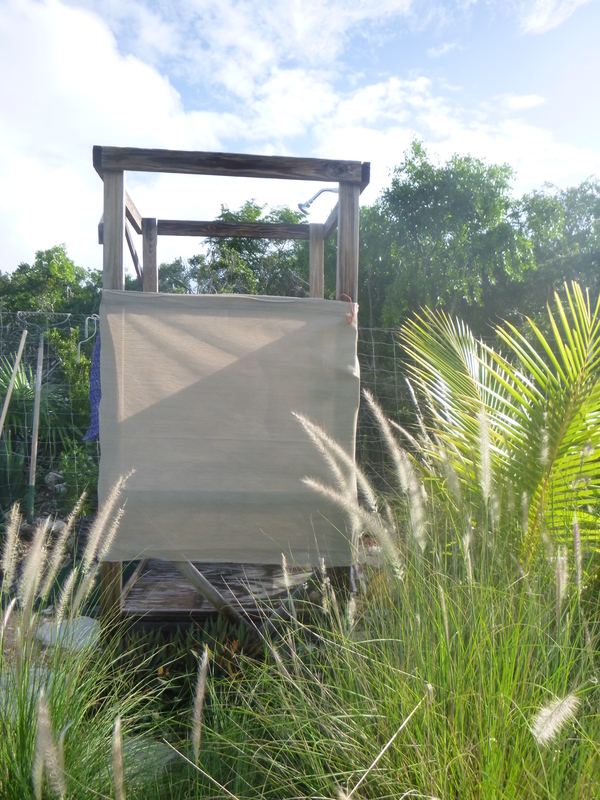 solar hot water for the outdoor shower made with 441 bottles. We grow our own vegetables/herbs/lettuces making the soil to grow them in with a mix of peat moss, black sand that we buy from a local and compost. 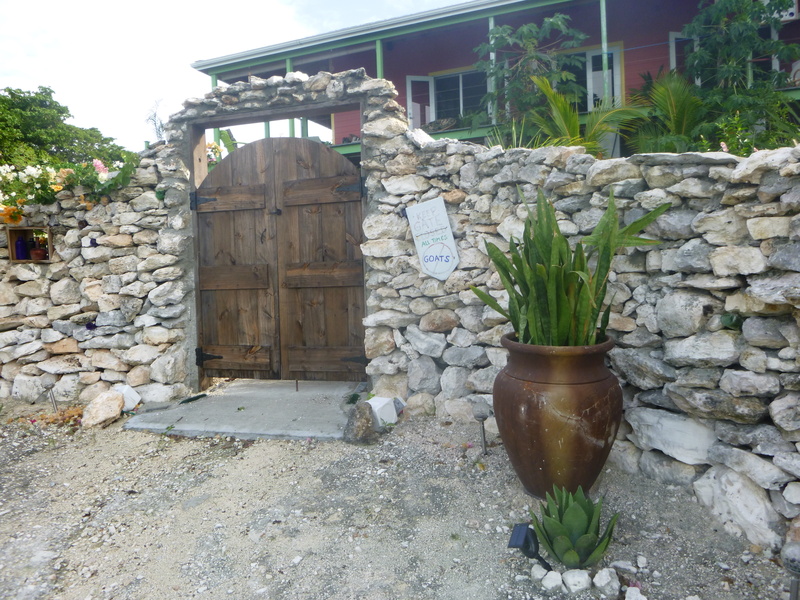 The local fishermen sell us grouper, hog fish, lobster and conch for our meals and we have a couple wonderful food stores close by to purchase most of what we need. “If you want it, don’t look at the price!” I tell friends. Gas is over $5 a gal and has been as high as $6.25 a few years back. We drive an 89 F-250 Ford pick up and a ’03 Dodge pickup truck. We have 2 trucks because 1 is typically in need of some repair. “Rust and termites never sleep” is a saying here. Something regularly has to be fixed in order to use it! There are not any poisonous insects or animals here but plenty of mosquitoes during rainy season, noseeums or “sandflies” that you can’t see but have teeth as big as a shark I swear! My perfume this time of the year is deet- ugh! But if I want to work outside I must use it- nothing else works trust me. I must close as I have plenty of work staring at me to get finished before any beach today. Busy putting away things we brought in on our pallets of shipments, 6 months of supplies. 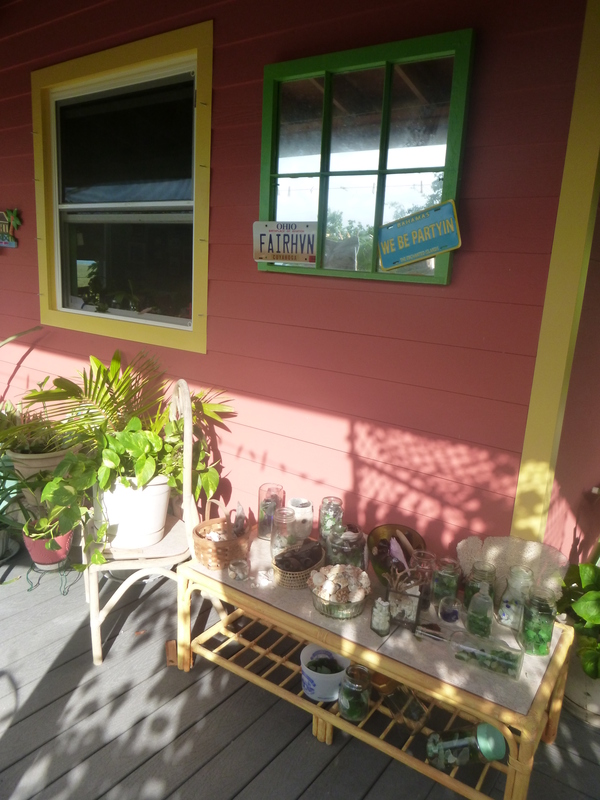 and more piles…….then the cleaning can start……..oh and planting the garden after making soil mix! Better get moving. John is already out power washing the deck, one other thing that never sleeps here is mold/mildew. 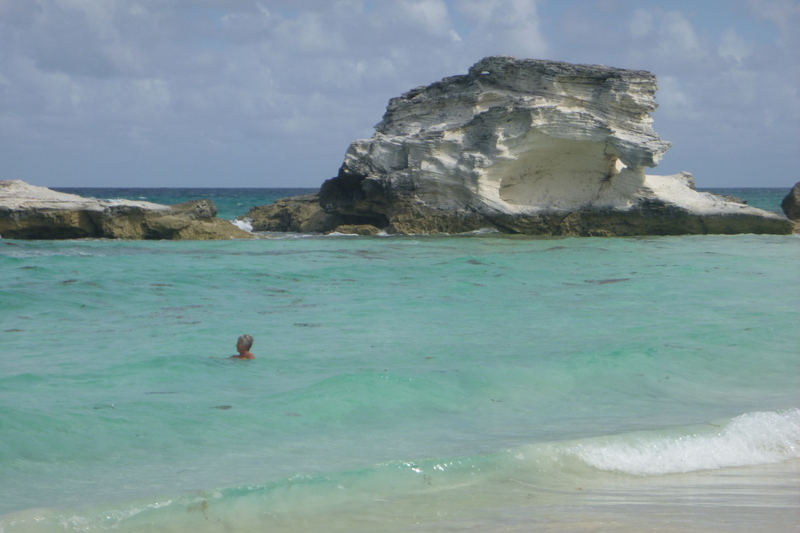 Life living on an island is never dull nor boring…..stay tuned for beach pictures…….. This entry was posted in Uncategorized on October 6, 2017 by bahama mama. so much going on……week 1…. Oct 8- my hubbys 67th birthday! We plan to drive south today. I almost just want to stay in our little safe haven here but we need to check on our shipment. It will be bad they say. Very bad. Flooding and damage past Grays only 10 miles south begins. That is where we would go for Friday night happy hours to hang out with our gang at Midway Inn. I know he had flooding- he always does. Past that it will only get worse. 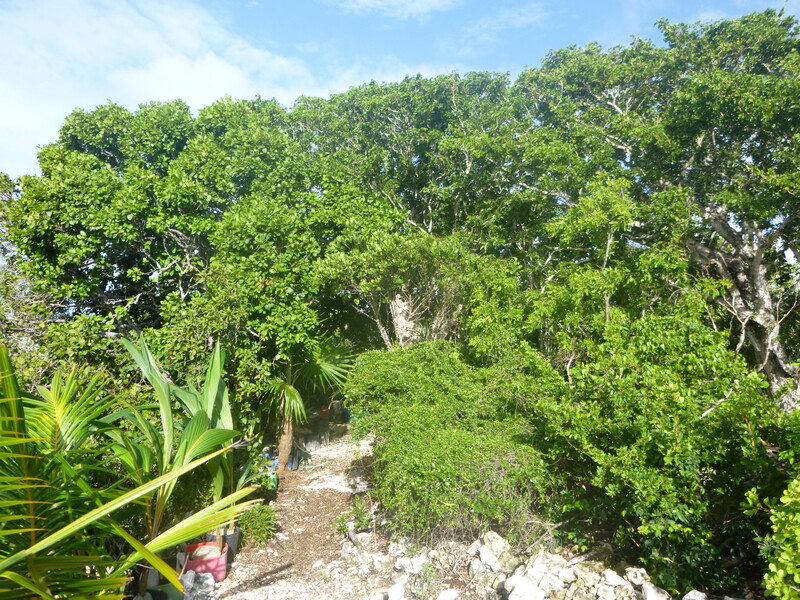 Many homes and small businesses are close to the mangroves and the tidal surge caused as much if not more of the damage that the hurricane did. We have heard of 8 ft of water down in Scrub Hill at Swamp Thing. Not sure if anyone can get past there yet. We also have heard that you cannot go past Clarence Town south yet the road is so flooded and even broke up. But more on that later. The last check on the internet while on the ferry I saw that Deadmans BTC- our phone company- has hooked up internet to sit in the parking lot and use so people can get word out to family or order supplies. So I writing this early this morning in hopes of copy and paste quickly and sending. Not sure how good the connection will be. If it is good then I will try to post some pictures. They do not even begin to show the destruction. I won’t post any of our place- it is fine. Solar hooked right up, fridge ran too and water pump came right on. 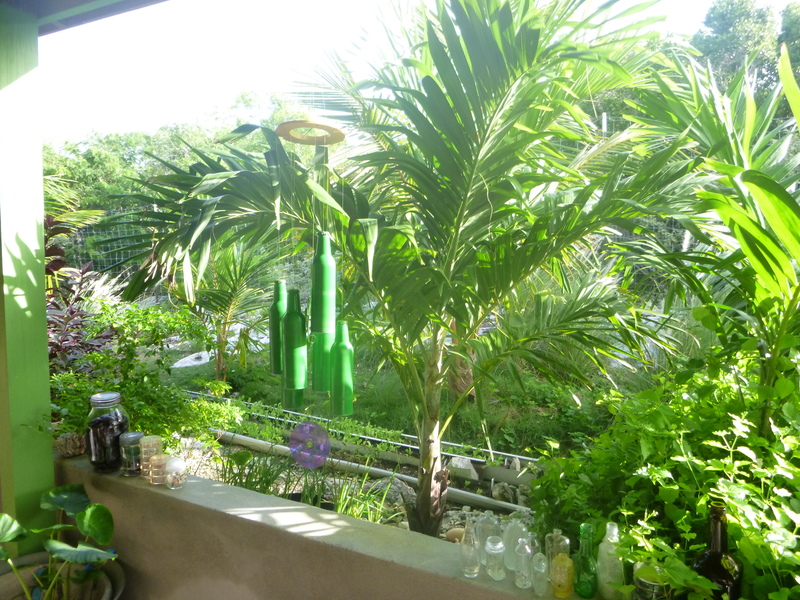 We can’t complain about all the up rooted coconut trees, plants and mess. We are blessed and feel guilty with our power- there is still no power but BEC is working all up and down the highway fixing snapped off poles and pulling power lines. They hope to have Salt Pond done this week. The sweet sound of generators running up and down the highway. I used to think that sound was annoying but not now……….Ok enough chatter. I have to be done with this by sunrise, we have to begin clean up in the early morning. It gets very hot here by 11 so we do inside things or have been down helping others clean their mess. With no TV or internet we watch the stars for a bit after sunset but by 8 have been in bed sleeping so wonderfully! 2 green flashes already BTW! Monday 5th Oct 4 a.m. Finally going home. 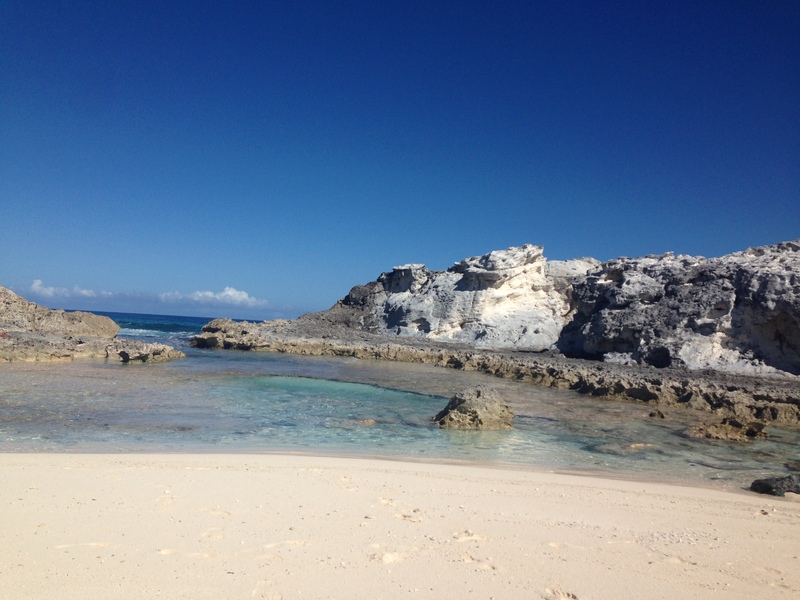 My happy place, Long Island Bahamas. But it is a very sad, devastated place right now. I don’t know what to expect. My emotions feel like when I was going to start my period years ago! CRAZY! But I hang onto all God has spoken to my heart and walk in faith of what HE will do and who HE is NOT what I feel. I WILL WALK BY FAITH AND NOT BY SIGHT! 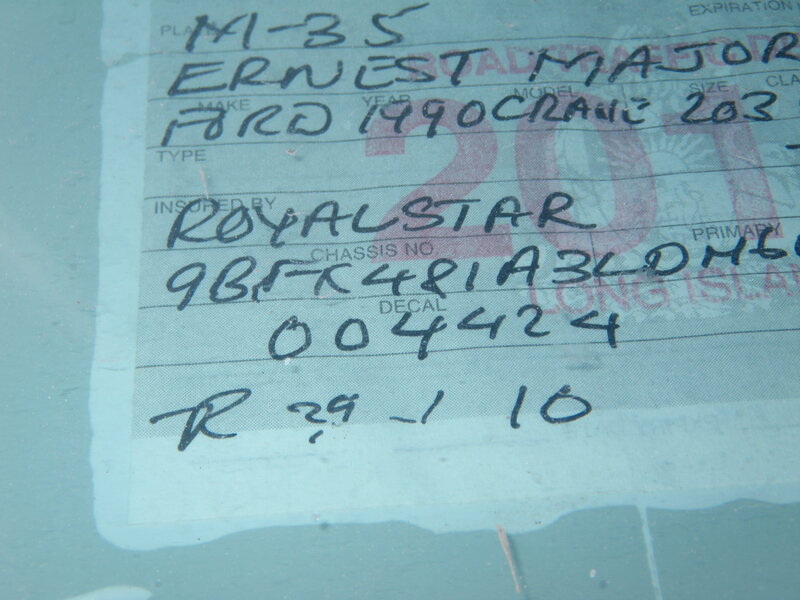 Fight into Nassau was on time – which as many of you know for Bahamas Air was a sign from God himself!!!!! We only got 120 days from immigration and that was after about 20 minutes of talking with a supervisor. Yes, John asked for the full 210. We tried to even explain about going to Long Island and don’t know how the roads will be even in 3 months to get out to commissioner or immigration on the island to renew but he didn’t buy it. He cared, he really thought about it but finally just took us to his super. Customs waved us thru with our 3 large and 2 carry on suitcases. 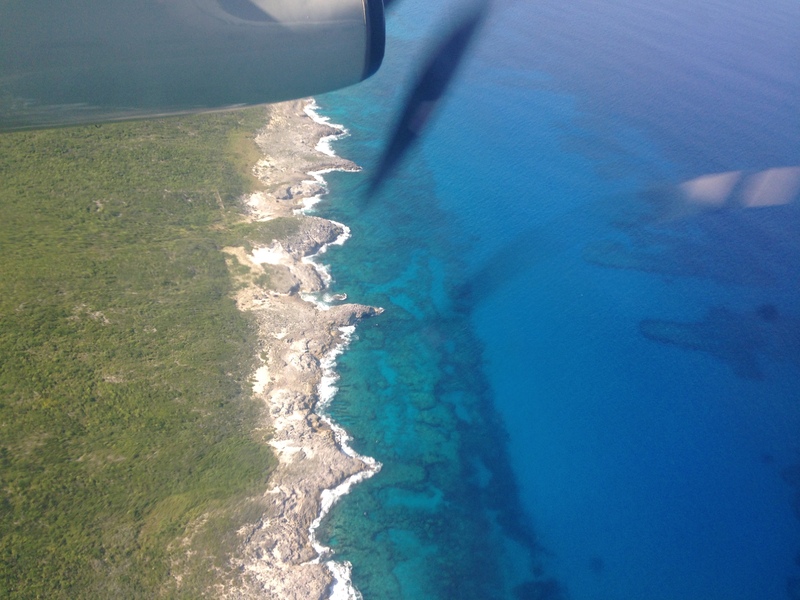 We checked with both airlines that fly into Long Island and “No we are not going this afternoon.” Bahamas Air only flies into Deadmans airport and that being badly flooded, no one knows how long it would be. One stop, not quick, at our bank right in the airport because who knew how long before ours would be open on our island? A nice taxi lady took us way over to Potters Cay dock to the fast ferry that leaves on Monday afternoon and gets into Simms Long Island on Tues. This would be the fastest way of travel and sort of a new adventure for us so what the heck?!! We were very early but I wanted to make sure to get on the boat. I did not want to stay in Nassau if I didn’t have to. With all our luggage we couldn’t leave the area- they didn’t board till 2. As we sat and watched them loading the boat we understood why they couldn’t take our luggage early. They were receiving pallets. Cars with people going to LI, semi-trailers. It was like watching ants work. Of course John thought he could better organize them! our fast ferry adventure awaits us! Time passed quickly as many who came to get on the boat we knew. If we didn’t by the time we landed on Long Island 18 hrs later we knew them all! Long Islanders are very friendly and many were going to check on family. Everyone had a story to tell and wanted to know ours. They could tell we weren’t locals by all our luggage! There are no cabins but the seats were comfortable and John and I grabbed 3 across each and spread out like everyone else. It would be our bed for the night too. Spirits were high during the exit of Nassau even though we were almost 3 hours late in departing. The snack area sold plenty of soda, beer, hot dogs and chips. 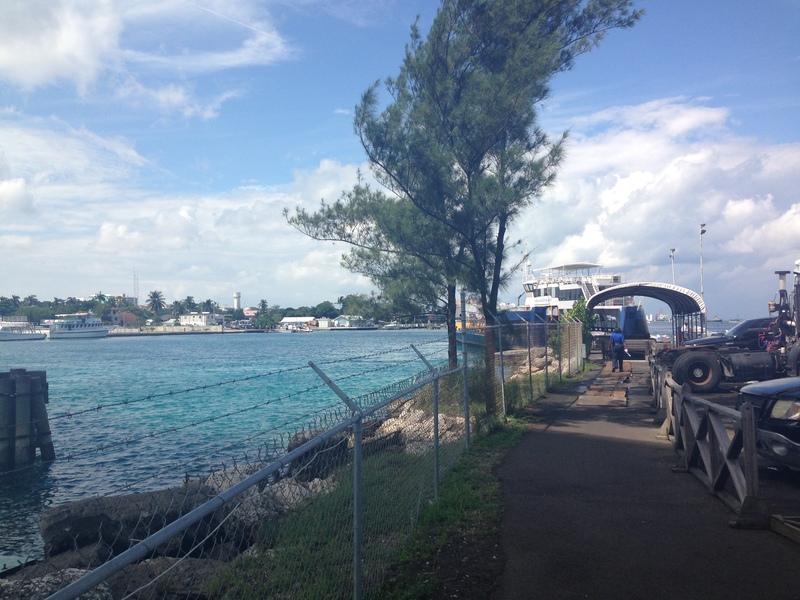 While we waited to get on the ferry John had walked down to where all kinds of stands sold vegetables, fresh conch and fish or cooked food. He brought us a large conch salad which was part of our lunch that we finished for dinner. later on the boat many were eyeing it in envy! I made chicken salad before we left Naples and that was our lunch on Monday, dinner and became our breakfast Tues morning. YUM! I think I won’t be making chicken salad for a few months! We met the young man whose father was the one casualty on Long Island-so far. Reports were that he drowned but he told anyone who would listen that “no way my daddy drown. 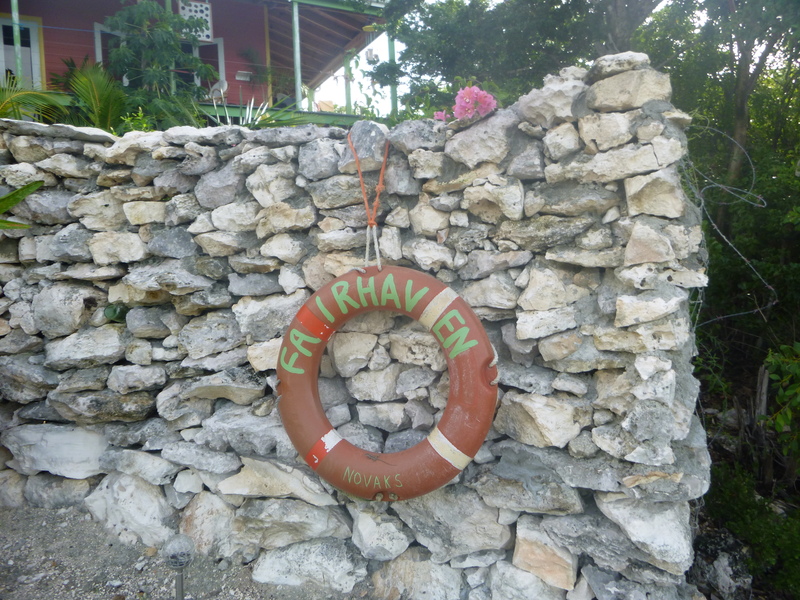 He live on a hill and he was a fisherman and a diver. He could swim better than any fish in the sea. I shoulda been there. I could have saved my daddy.” He told this over and over again, to anyone who would listen. We now hear he died of a heart attack. The person who told me that is barely 30 herself and she said she felt she was going to have one too.” It was so scary and seemed to never end.” Gloria did a video during the storm to show all the howling and whistling they had to endure for over 30 hours. Enough to make you lose your mind. I now have seen the depression and trauma on my friends faces. Anyone who is a counselor could be useful now too. Catching the first glimpse of Long Island in the distance the boat became subdued. Almost an hour passed before we landed in Simms. We had barely spoke those last few minutes. But hugs were all around with warm wishes. At the dock I began to hear raised voices. “What you mean you don’t have anything for us in the north? All those planes landing in Stella Maris and they don’t give us nothing. They say the south is worse. WORSE? We got needs too”……..Tension was rising. The north has power we hear and has no idea how bad the south was hit. They have no way of knowing. Many have never been to the south. 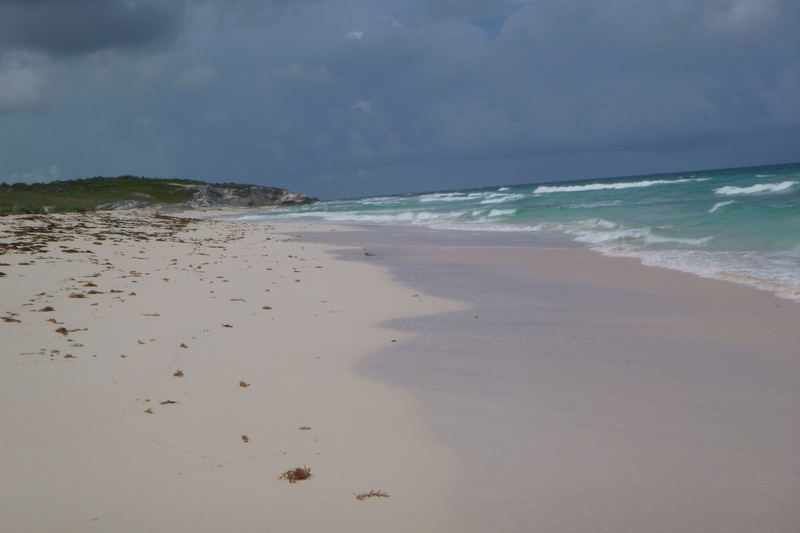 It is some of our favorite beaches! Don’t know if we will even get to them this year at all. Doesn’t matter. Thankfully a friend was at the dock to get a generator so he carried us home. I had no idea how to reach anyone on island to tell them we were coming on the boat. John went with the flow very well. NOT knowing how to get from the dock to our house is something he usually would have to have planned. But also knowing how Long Island works- stand on the side of the road and give a slight wave down, someone will stop and carry you as far as they are going. Even the school bus will pick you up!!! Speaking of useful- there are so many needs. So much repair and clean up to be done. Rebuilding too of course but just the cleanup that someone with little talent or skill could be put to work. SO TO ALL WHO HAVE ASKED IF I COME CAN I BE USED? YES. A RESOUNDING YES!!!!!! SUPPLIES…..EVERYTHING IS NEEDED- FROM CLOTHES, BEDDING, MEDS, ROOFING FOR SURE. AND WATER!!! Oh my- the need for water. 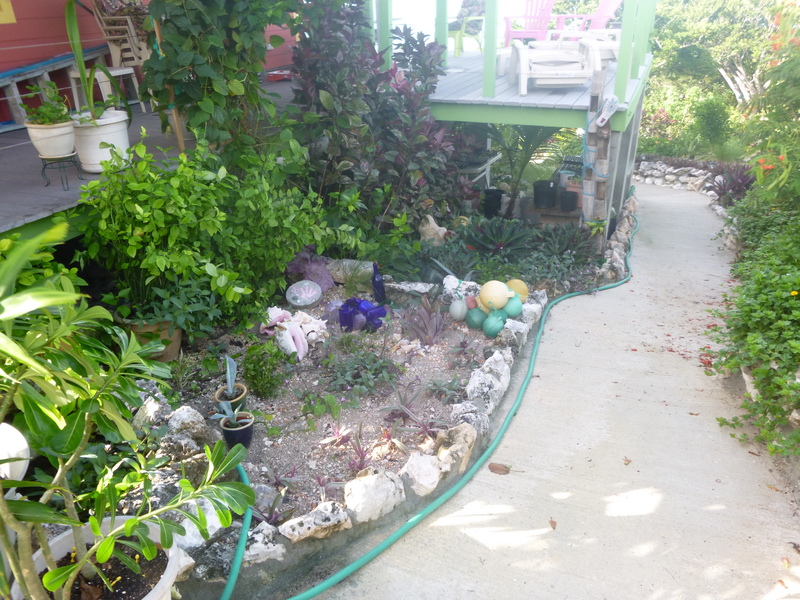 A couple in Exuma ran their boat over on Monday and brought what bottled water they could put in their 17ft boat. People were desperate. 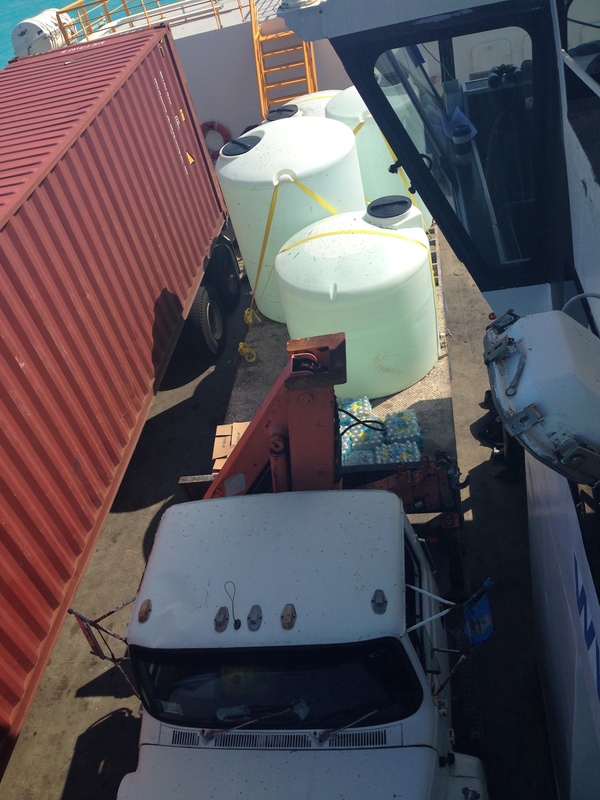 So they got on the fast ferry on our stop in Exuma that morning with a truck loaded with 3 huge barrels of fresh water. 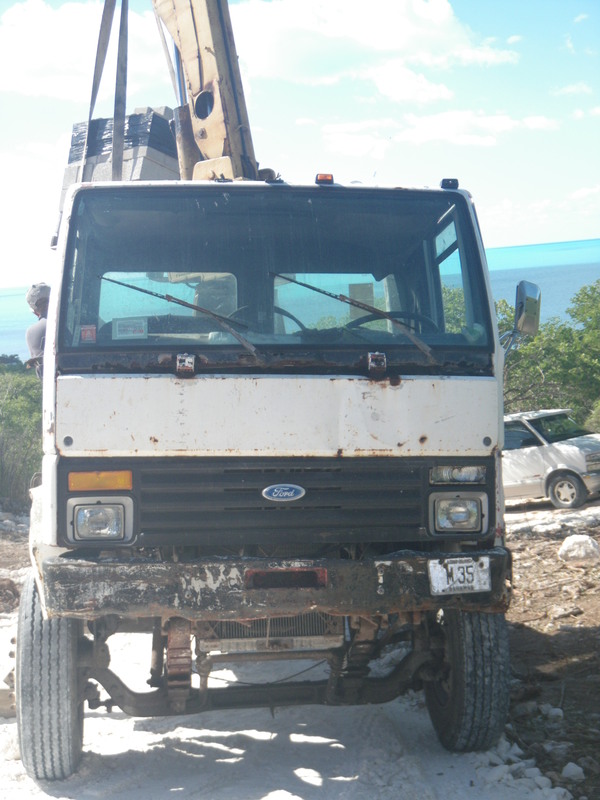 Someone in Exuma donated the truck and another donated the water. They are donating their time and energy. A couple I know who live down that way had gotten up before day break and began walking to get to the husbands boat. It was they only one left standing-untouched from the storm. They walked in water for hours. 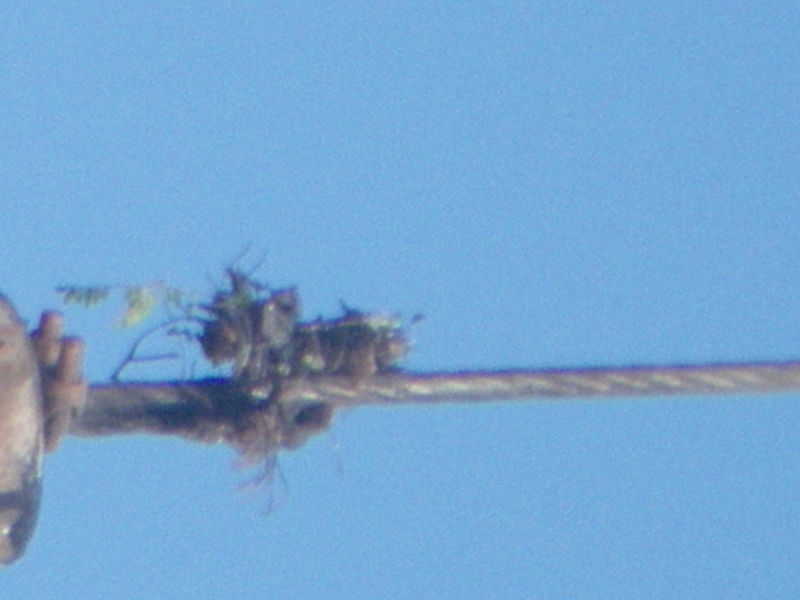 She was interviewed by the crew that came in to assess the needs and damage and she was pleading for help. “Please come, send anything. Send everything. These people are desperate. They had little before and now they have nothing. They need baby items, medication, water. OH THE NEED FOR JUST WATER LET ALONE FOOD” I wished I could have shared the video and maybe many of you saw it. Can’t remember! One couple here in salt Pond, just down the road from us a bit, lost their home. They literally ran for their lives in their underwear! They live right on the beach. The surge from a high high tide-that comes with the full moon which just passed- and wind from the hurricane at over 140mph coming from that side of the island-usually comes from the east side- but this one came from the south. That meant the winds would be circling from the north west. Totally different from usual- if there is any usual with a hurricane! That said when the water started to rise it came fast. Many stay in their homes during the storm and hope for the best. That is how deaths occur. Charlie- who lost his home- told us” I ran out the back door in my underwear”. The surge blew in the front windows and sliding doors. I stood in the living room with seaweed at my feet. It rose at least 4 ft. The toilet was under water. They are trying to clean up but his wife is finally conceded to fly back to her daughters in Fl. She had her beautiful smile when I came in to hug her saying” It is all good Penny, it is all good” She is traumatized and needs to go.Their yard looks like they are drying out clothes and furniture. NO. That is where the storm pushed it all!!! A few houses down Cheryl has 2 boats- 2 BIG boats in her front yard. Fishing boats are all up on dry land. Many fishermen lost their homes and now their only way of providing for their family is gone. We still want to hike out Indian Hole Point Rd. Tim and Sue are there and as are a German couple. No one has seen them but we have learned there is 4 ft or more of water . We saw lights on at Tim’s last night so we know they are fine just no reason to hike out in all that water. He built high so I am sure the house is fine too. The Germans are on the beach and I am worried…….just doing things one at a time so today we hope to hike out there. But we do need to go south too……. Damage is one thing here but the hearts of the people are in need of healing and care. Their eyes are glazed. Their smiles are pasted. “I just want to climb back into my bed. I have no appetite. I can’t believe this happened. It still feels like a dream….. This entry was posted in Uncategorized on October 26, 2015 by bahama mama. 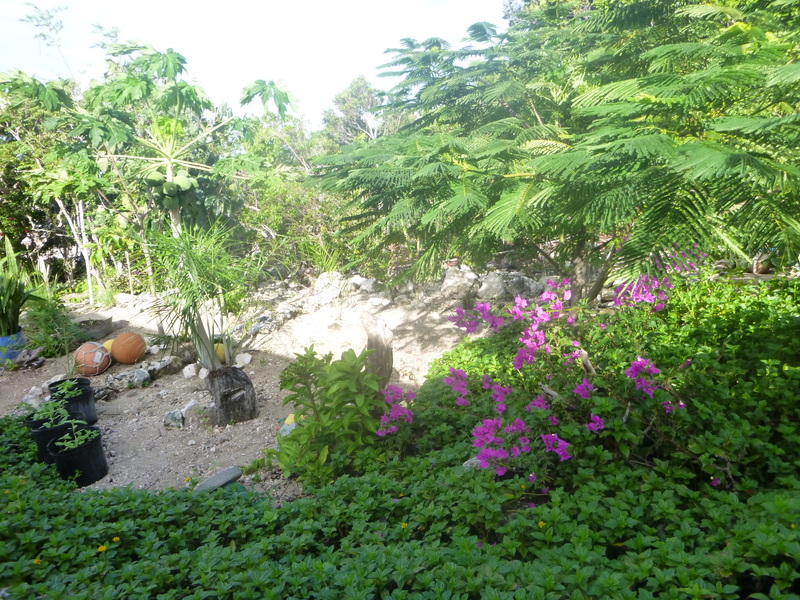 Gardening here on our island is not easy. I have to make soil to use since the only soil we have is sand. Sand that has no nutrients in it for nourishing for the garden at all. 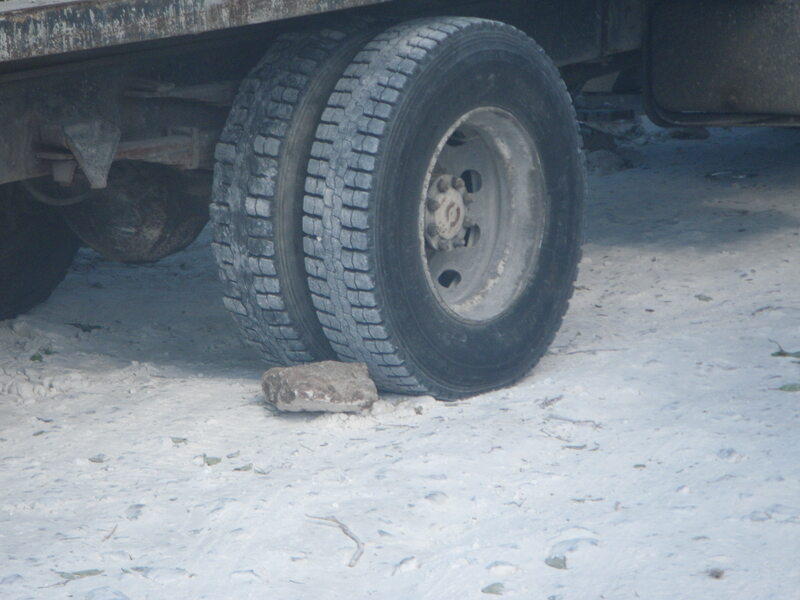 We ship in peat moss, go to a Bahamian friend to get sheep poop and add “black sand” they sell here by the truck full. I work hard to mix this soil and get my seeds to grow. I do worry about these tiny seedlings! Too much wind, rain or sun rots them quick and I have to reseed. But when I reread this about making sure the soil is good and the plants will take care of themselves I relax a bit! Tomatoes, fresh greens, radishes, beets all taste so good come January! I will enjoy and bless the fruit of my labor. However, I want to be good soil-have a good heart so I can bear fruit for God’s glory too. I try to remember I can not make myself “good.” It is the Holy Spirit dwelling in me that does the work, Galatians 5:22-23, so that I can bear fruit. I want my heart to be open to receive what God has for me. I can tend the soil of my heart keeping it soft, receptive and obedient to His Word. Then I can yield the fruit of righteousness. Lord, I want to be soil in which You can plant Your Word with it’s promise of fruit. I want to be open to You every day so what You have planted takes root. Help me Lord in this I pray in Jesus name. Amen! What kind of soil are you……. This entry was posted in Uncategorized on October 29, 2014 by bahama mama. 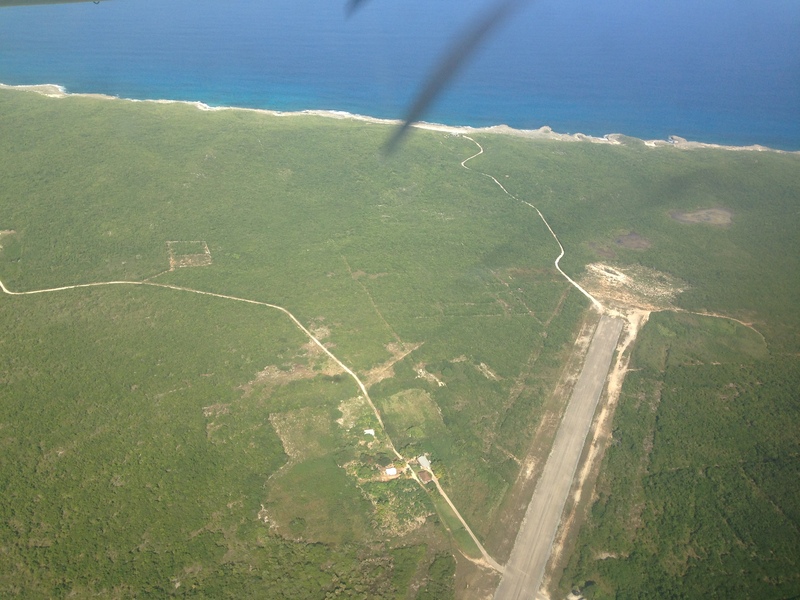 Flying over the island we circled the airport to make sure there were no goats or cars/people on runway before landing! I guess that was an issue a few times. And YES you can cross the runway on foot or car! Aren’t the reefs amazing?Those are cliffs and we can’t get down to those reefs and I imagine it is not safe to try at all! But oh the beauty! This week it is high tide during the afternoon. That to us means -no beach finds! Discovered treasures at low tide, right along the surf or where high tide had hit and treasures were left are the key! Yesterday on the way off the beach tide had come down but when the waves were hitting the sand it was still rough to get in. I stopped and threw my beach chair and bag down and ran in. A big thick dark green sea glass was rolling in the surf and I wanted it! Let me just say that by the time I got that beauty I was soaked up past my previously dry suit and cover up! When John met me on the hill he asked “was it worth it?” Of COURSE!!!!!!!! 2 nice green ones! The “swimming hole” or “jacuzzi” as we call it is all filled in and I could barely get in past my knees! We did have a good swim on the other beach just around the corner. 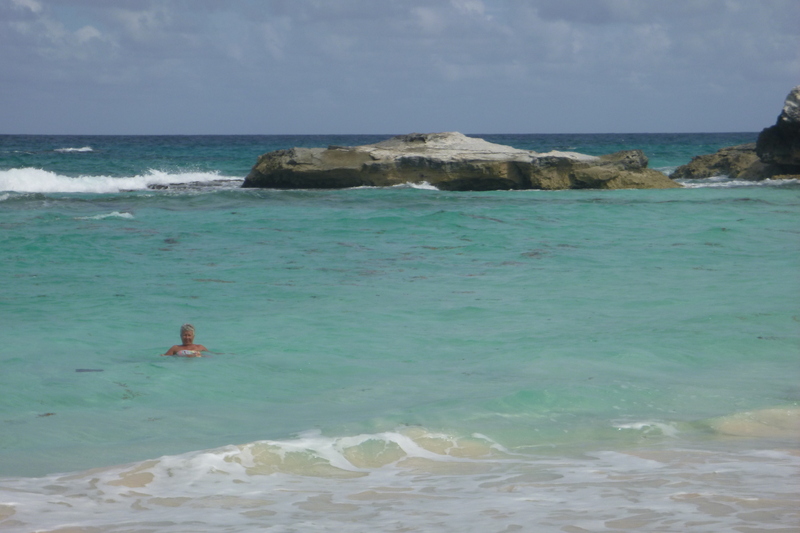 My body just melts when I get into that crystal clear blue green salt water. All the aches and pains of the morning work flow out with each wave. HEALING……. This entry was posted in Uncategorized on October 12, 2014 by bahama mama. I love music! 60’s, 70’s, jazz, classical, big band, marching band, easy listening, light rock, but mostly worship. Worship music draws my spirit to where I need to be-closer to my Lord. I can’t sing worth a lick- ask my family or close friends…..waaayyy off tune. But the bible says “make a joyful noise to the Lord” Psalm 98:4. I CAN DO THAT! I put together a playlist on my iTunes – Yes I am becoming very techy!!!!! This playlist is mostly worship music that I love! However, I now use it for my walk as motivation! My pace has picked up and I smile as I belt out these songs…..
Man does that push me on not only in my Christian walk but in my work out. Dare I say I struggle in both? YES I DO! I am learning that He doesn’t let me down and I can do this!!!! PRESS ON!! DO SOMETHING by Matthew West is the 2nd song to come on in my playlist. I always have to wait to start something on Monday or when all the chips are gone so they don’t tempt me or when…well you get the idea. SO WHY NOT NOW??? Right NOW! I want desire, I want fire back in my life. I am tired of waiting for someone else to do something so I am doing it!!! Again, both in my spiritual life and my workout. I want my health to be on top so I can be ready “in season and out of season…..2 Timothy 4:2. Friend of God by Israel & New Breed, Carry on by Fun, We Believe by Newsboys, Washed Over Me by All Things New-OH does that have a great beat for picking up the pace!!! Where I Belong by Building 429- brings the pace down a bit but I lift my arms up in worship to my God! Even clapping above my head, great for added workout ‘eh? Build Your Kingdom Here by Rend Collective Experiment…I can dance to this one! I can almost run to Best Day of My Life by American Authors! I LOVE this one! Today is the best day of my life especially if I screwed up yesterday! Everybody by Backstreet Boys kicks it up for me then Happy by Pharrell Williams OMG!!! It just makes me….HAPPY!!! Just when I need it most Angel by Shaggy comes on. This is a little bit of island music for me to envision that happy place when I may want to quit! I Want You to Want Me by Cheap Trick has that great beat to pick it up another level and keep going. Then when I can barely keep going- Lift Me Up by The Afters pounds into my ears with a drum beat I can at least march to but these words help too…..
Change can and will come and it is up to ME. I can’t do it alone nor do I want to-I am a people person.For example, I met a woman last July and since then she has lost over 140 lbs! I have seen her struggle and fall but she inspires many as she shares her journey of regaining her health. Also,last summer I studied a great book-So Long Insecurity you’ve been a Bad Friend by Beth Moore- with 5 wonderful women here at our campground. As we came together early Saturday mornings to share what we learned I saw hearts open to grow and change and move on even in the hills and valleys of life. I was blessed to be a part of such openness and sharing. I still go back over my notes as the Lord revealed Himself and His word to me… “seek the Lord and He shall be found” Isaiah 54:6 …that is for another time…….PRESS ON! This entry was posted in Uncategorized on July 7, 2014 by bahama mama. 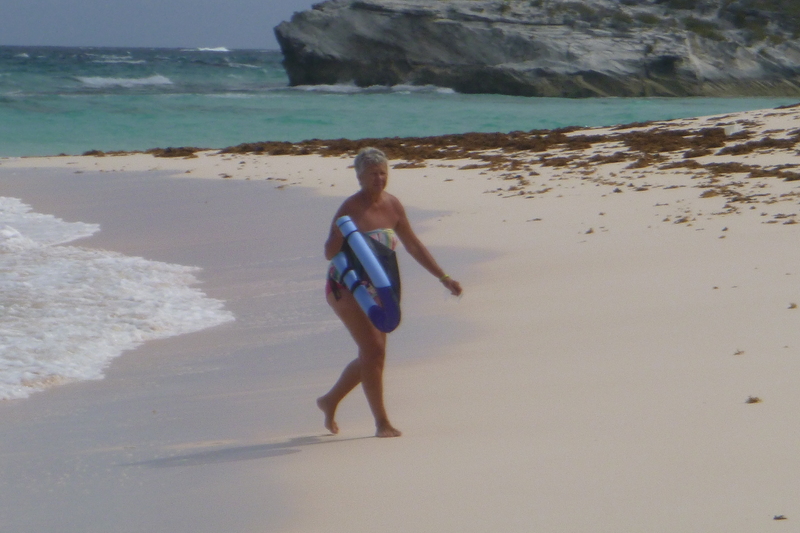 Bahamiana is a word my friend Susan Koster uses to describe interesting,funny happenings here in the Bahamas. I call them adventures. 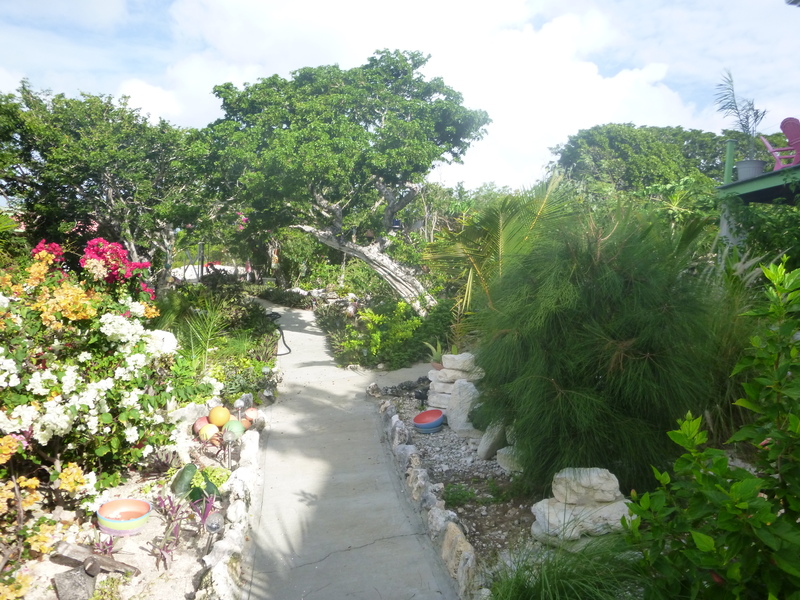 Life on an island is always an adventure to me! Building again here is a huge adventure and every day I wait on pins and needles for John to return from the site to show me the progress with pictures and tales. He has been busy coordinating workers and deliveries. If not done in the right order there could be a problem-or even when done in the correct order there could be a problem! Yesterday was delivery day for sand,cracked rock, cement and block. 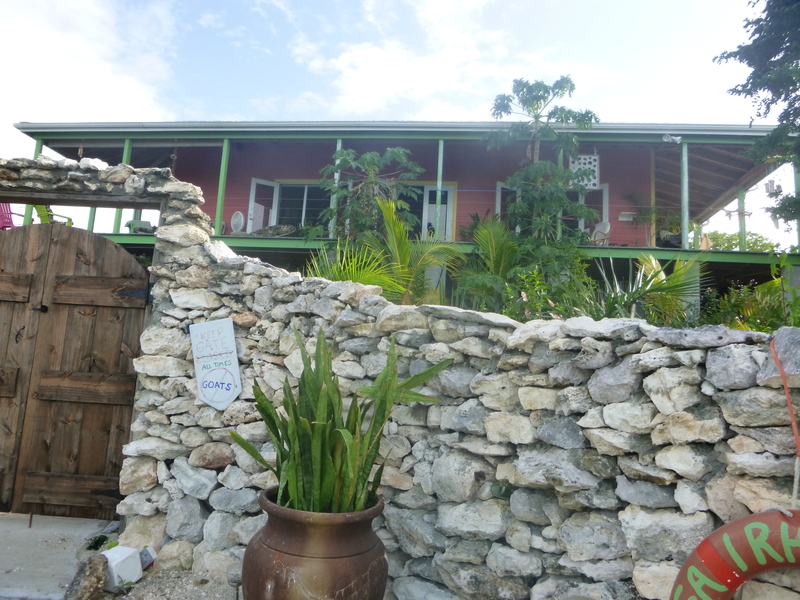 He got everything but the cement….that is another Bahamiana…….. 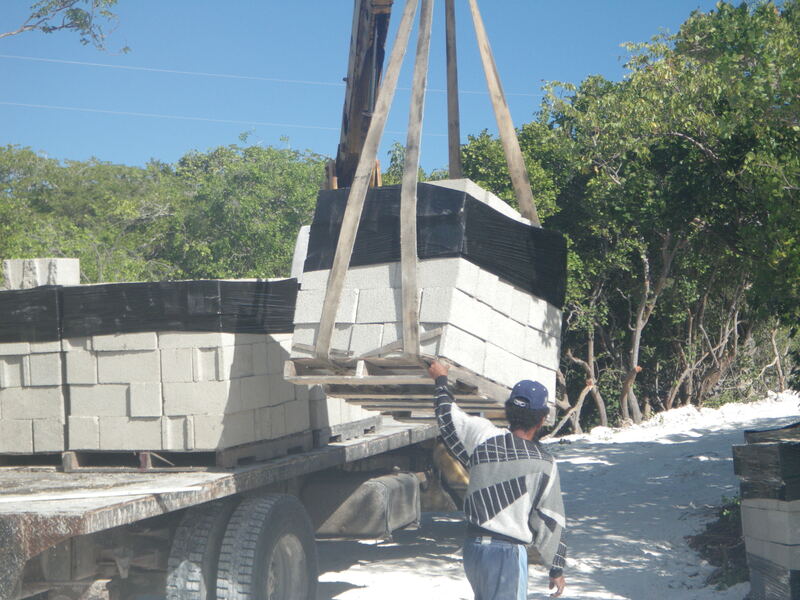 The crane to lift 4000 lbs of cement block appeared in the driveway on time-sort of. John needed the crane to go all the way into the drive as close to the work site as possible but as soon as it began the ascent up the hill it started to spin and roll backwards. 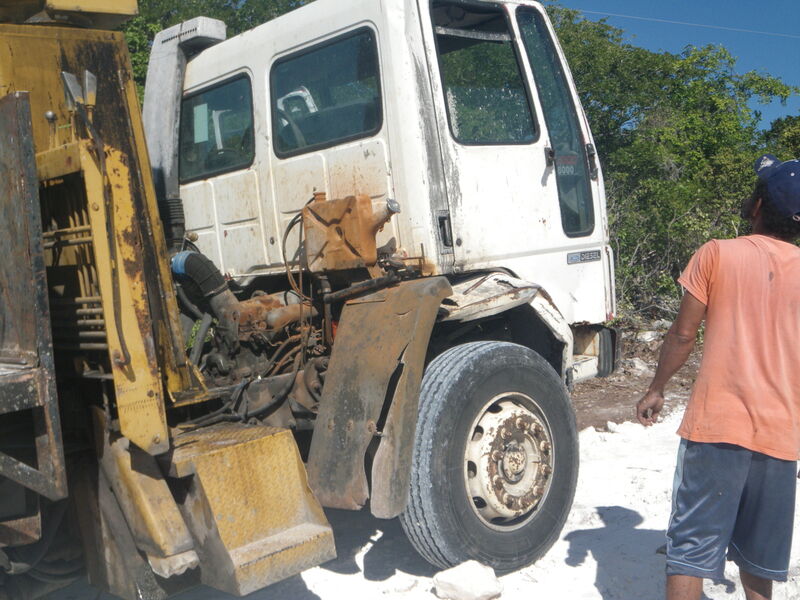 As soon as he stated rolling backwards down the drive, a barefoot Bahamian jumped out of the passenger side and began to throw rocks behind the tires to stop it! The hydraulic arms the crane placed down to steady itself while off loading sank into our road-it’s not packed hard just yet! The guy had one piece of wood to keep it from sinking, but there are 2 arms-(wouldn’t you want to carry 2 pieces of wood?) John tried to give him more wood but it didn’t help any so the barefoot Bahamian ran into the bush to retrieve a large rock to steady the other side. 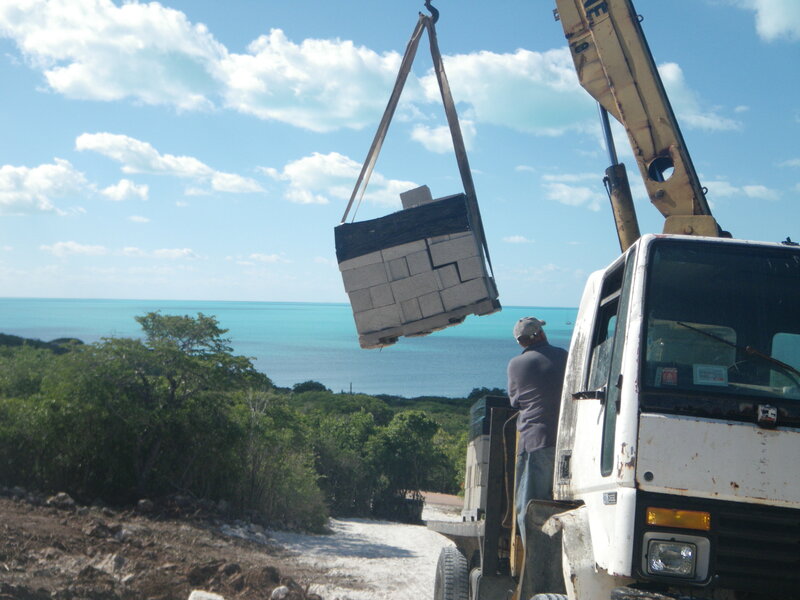 STEADY is the key word here……..as the belted pallet of blocks twirled from the truck, the barefoot Bahamian stood underneath it to steady it. 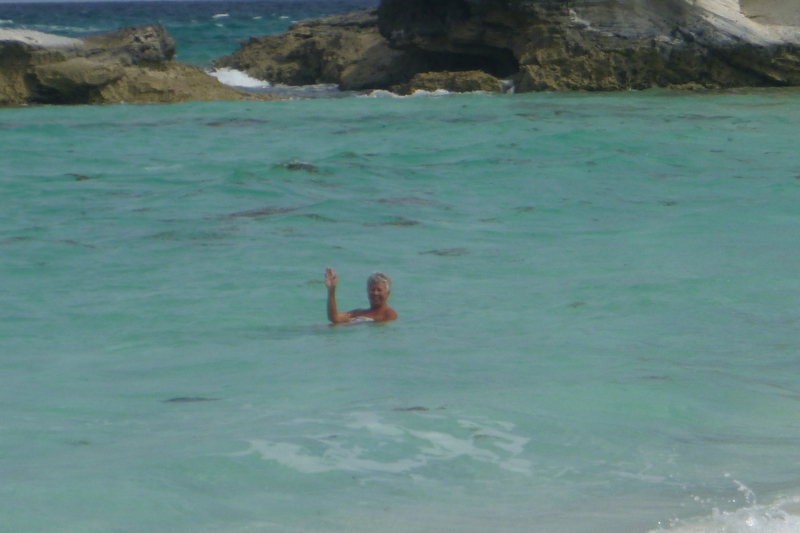 John wondered from the side lines who he would call when the whole thing collapsed on our barefoot Bahamian- 911?? ha! Why, you ask, would John be worried about the frayed belt around the pallet or the frayed cable moving the whole thing? 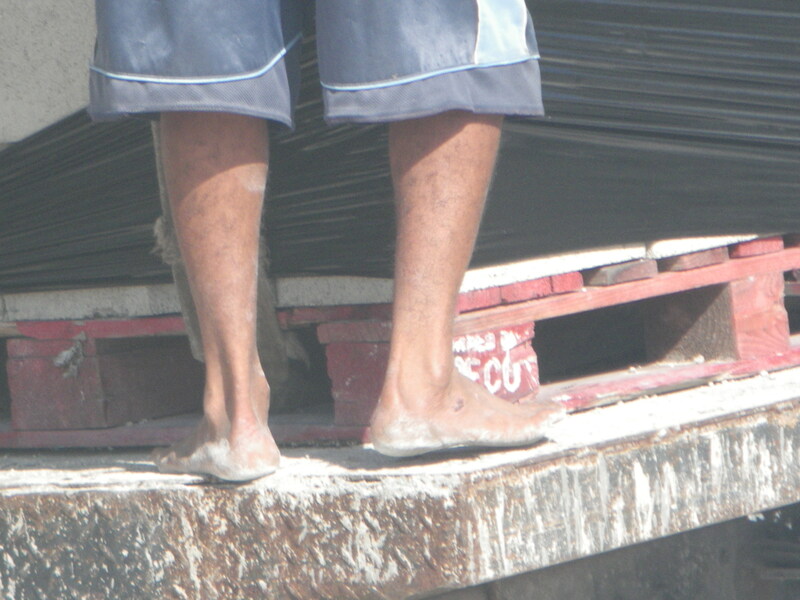 barefoot Bahamian walking under pallet…yikes!! swinging and twirling……..
hey- it (eventually) got the job done, scary as it was…. 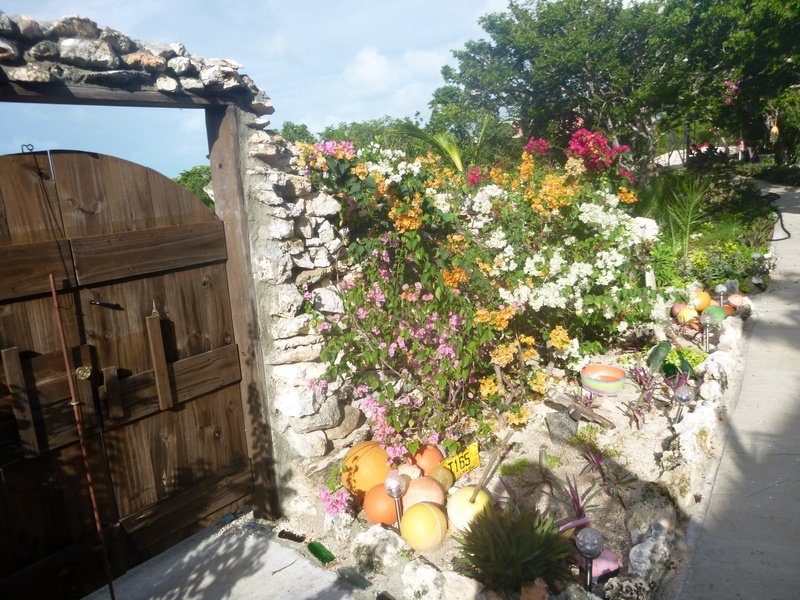 This entry was posted in island life on June 24, 2014 by bahama mama. However, I want this post to be about our new house-which many of you know we were blessed to sell our1st house- 5 acres/4 bdrm/4 bath/3200 sq ft house in 2008. 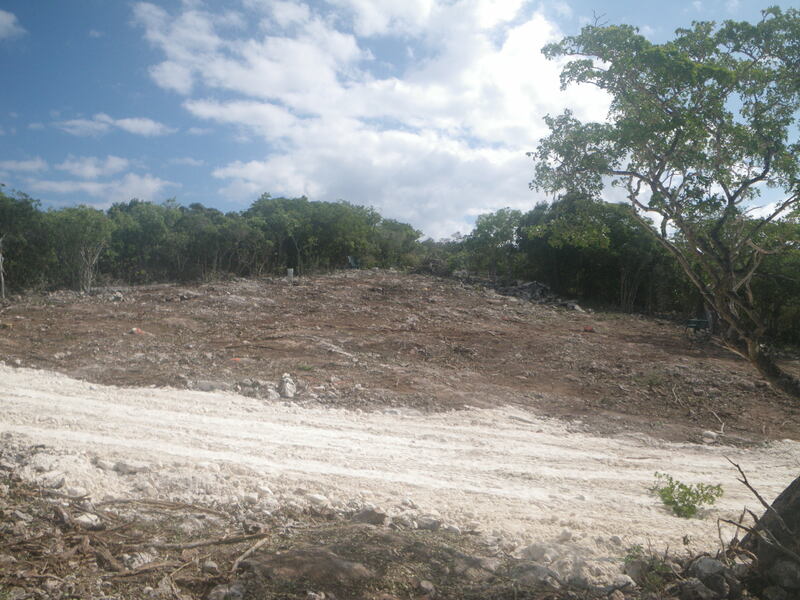 We searched for land to build much smaller and finally in 2010 we began the clearing of our almost 2 acre plot here in Thompson Bay! 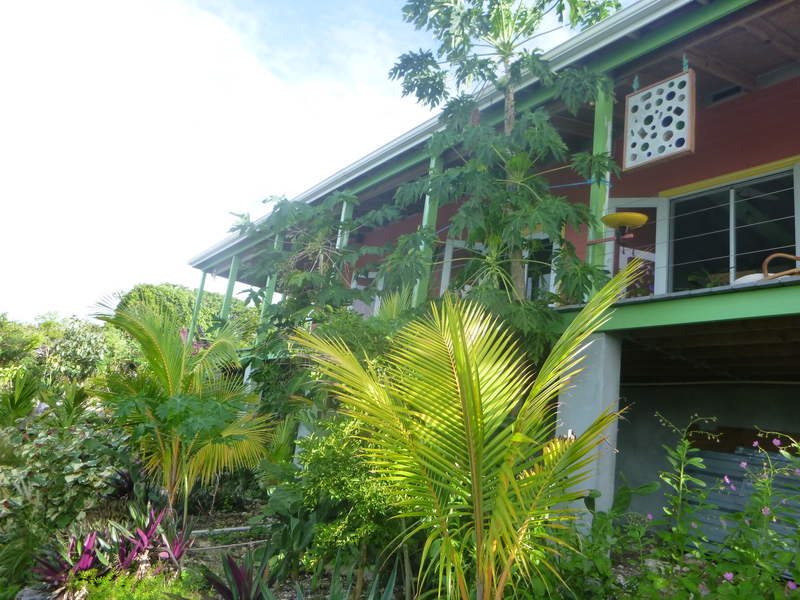 John designed the house-with my help of course- and had a Bahamian crew of 3-5 local guys to oversee for 4 months. 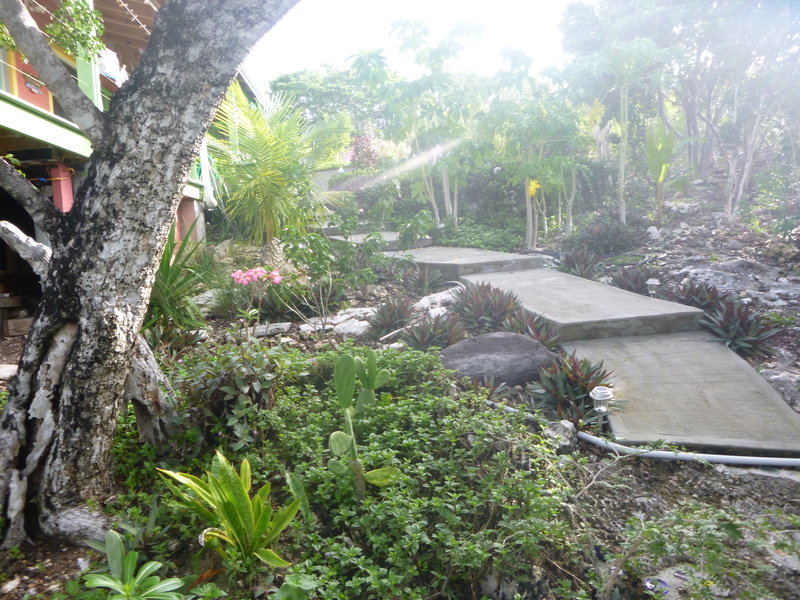 We moved in before the tile or running water was done but I wanted to be up on this hill!!! 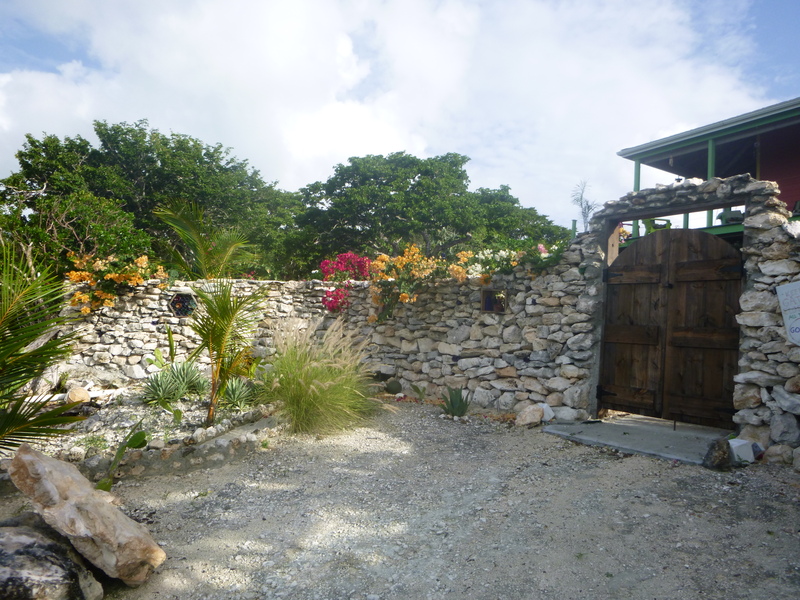 For 2 winters- 6-7 months each- we have finished many large projects, huge gardens and a wonderful rock entrance wall. WELCOME TO FAIRHAVEN COME IN!!! John hauled everyone of these rocks out of the bush and hand stacked them himself!! found ring on the beach and John painted our house name on it! we built on a hill so house is up there! 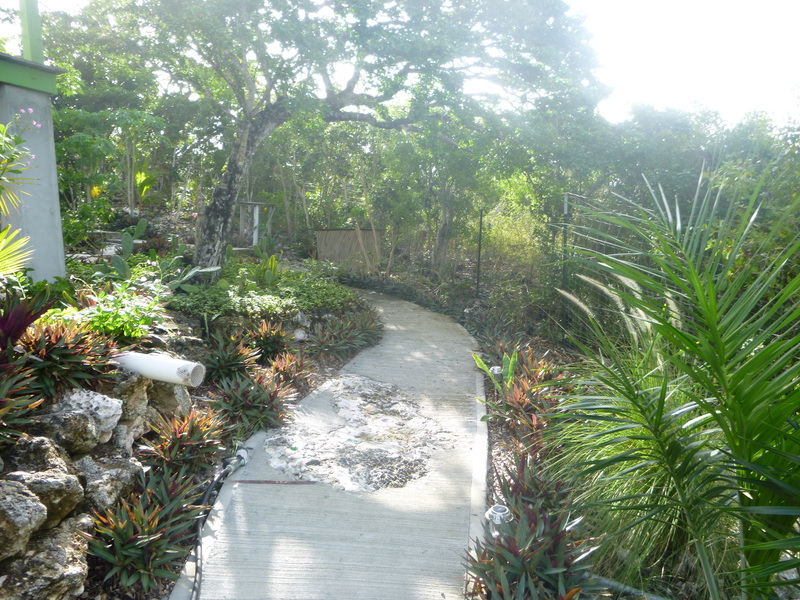 just a few more steps…..come on up…. 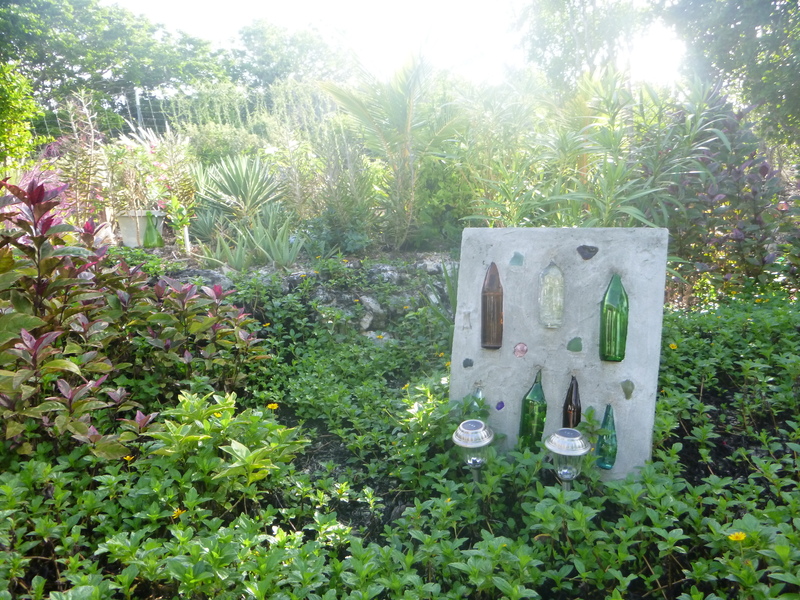 green bottle wind chime – yep you guessed it- John made it! big sun catcher John made for me 6 yrs ago! bottles all found on beach-of course! 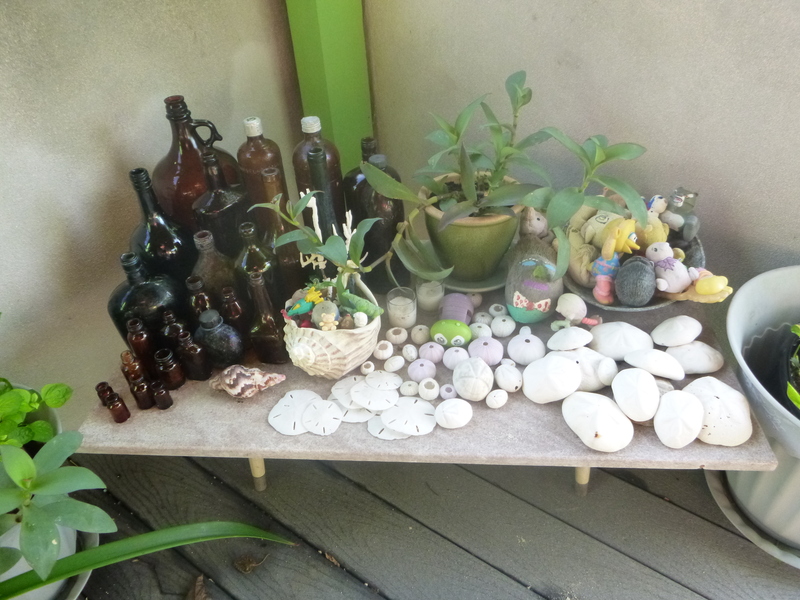 table full of beach finds…. 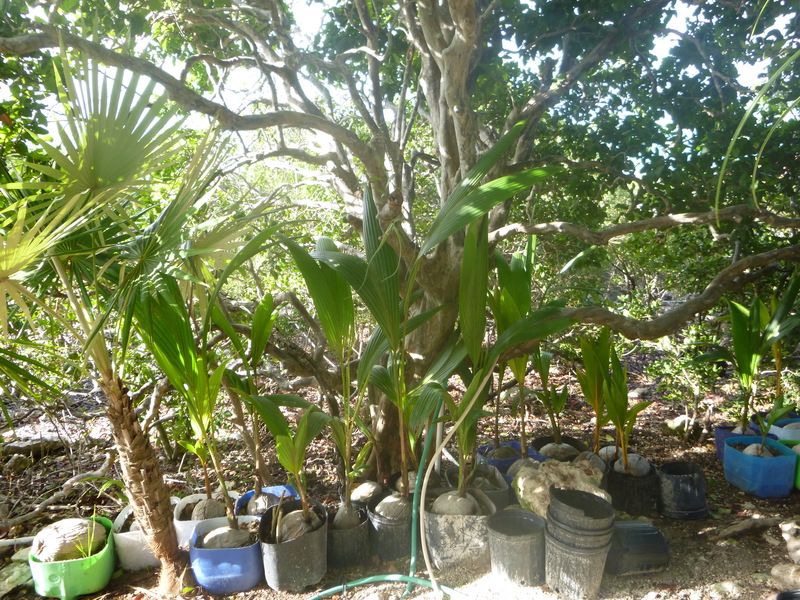 John loves to get coconuts and pot them- he has grown everyone of our …..mmmmm…100 or so coconuts on our lot! 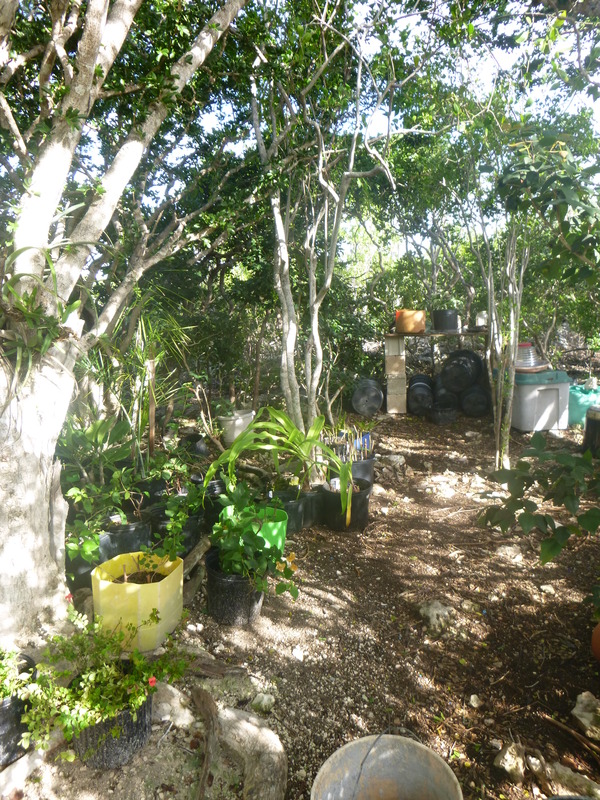 shade house area- where we pot and the nursery where we keep cuttings….yea- not a bad place to work! this area was here when we started to build. 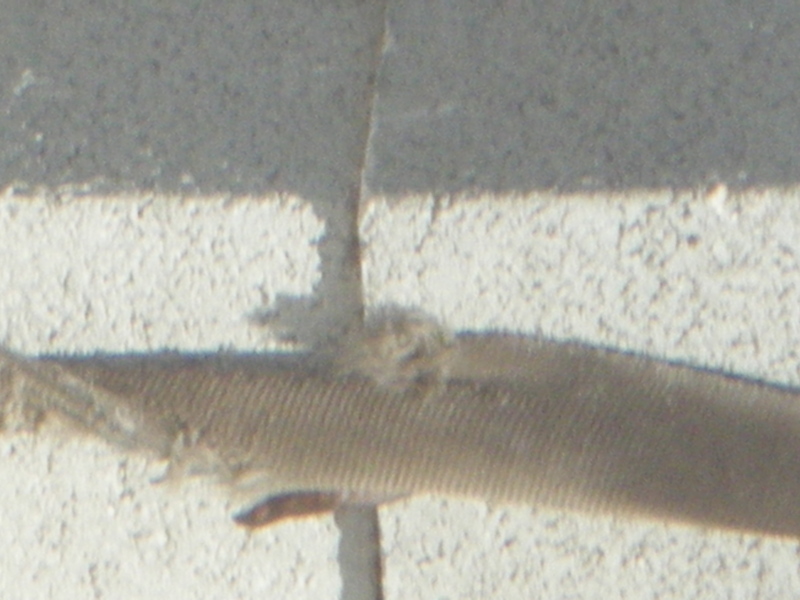 All I had to do was clear away some bush and when stepped in……OMG! Clear and ready to use! this used to be the construction drive. When we got the last load of working materials up here I begged John to let me close it off and make gardens. He even hired a local to help move the rocks to build it. sometimes I get so busy in my garden I forget where I actually am. Then I turn around and gasp at this view…….awwwww…. 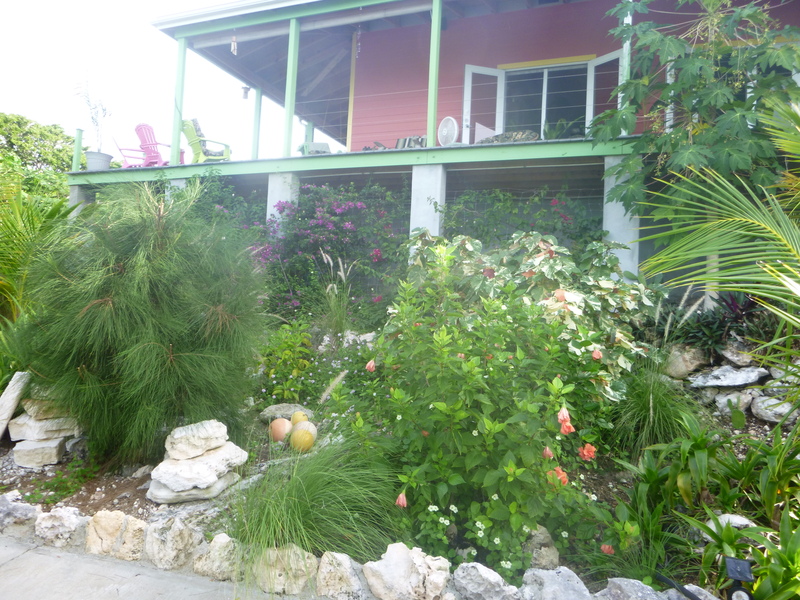 This entry was posted in island life on December 24, 2013 by bahama mama.